By Kori ~ June 27th, 2012. Santorini is an island in the southern Aegean Sea, about 120 miles southeast of Greece’s mainland. It is the largest island of a small, circular archipelago, which bears the same name and is the remnant of a volcanic caldera. Best known for its deep blue waters, breathtaking sunsets, and distinct red, black, and white sand beaches, Santorini has a rich tradition of winemaking that dates back to 3500 BC. However, it was the catastrophic volcanic eruption around 1600 BC that formed the islandâ€™s unique terroir. While Santorini is most well known for its popular dry white wines made from Greeceâ€™s most noble white grape variety, Assyrtiko, the island also produces the original Vinsanto or â€œVini di Santoriniâ€ for which the island became famous in ancient times. Recently, we had the opportunity to taste a couple of Greek wines from Santorini in a blind samples tasting, the 2004 SantoWines Santorini Vinsanto Dessert Wine and the 2011 Boutari Santorini Dry White Wine. Both wines were very good, but we especially enjoyed the Vinsanto dessert wine. 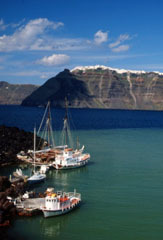 SantoWines, founded in 1947, is the cooperative winery on the island of Santorini and continues to flourish with the support of its 2,500 members. With over 130 years of experience in the wine industry, the Boutari Company owns six wineries in Greece. Boutariâ€™s Santorini winery opened in 1989. Folks, these Greek wines made primarily from the Assyrtiko grape variety offer you a palate expanding opportunity. You probably wonâ€™t find these wines on the shelf at your local grocery store, but I encourage you to give them a try if you can. And for those of you who enjoy a challenge, you might be inspired to seek membership in the Wine Century Club (the club for adventurous wine drinkers who’ve tried 100 grape varieties or more). 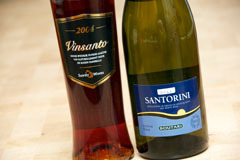 2004 SantoWines Santorini Vinsanto Dessert Wine (PDO Santorini, Greece): 75% Assyrtiko and 25% Aidani. Naturally sweet wine from sun dried grapes. Medium-deep amber in color. Aromatic with caramel and nuts on the nose. More caramel as well as orange peel and a touch of pineapple come through on the palate. Sweet and medium-bodied with lively acidity and a very long finish. Well-balanced and very smooth. 2011 Boutari Santorini Dry White Wine (PDO Santorini, Greece): 100% Assyrtiko. Pale straw yellow. Aromatic with floral notes, citrus fruits, and the fresh scent of an ocean breeze on the nose. Lime, grapefruit, and more floral notes come through on the palate. Dry and light to medium-bodied with tart acidity and a long finish. Crisp and refreshing. A pleasant summer sipper as well as a great food wine.